Springbok is a online & mobile casino established in 2012 and mainly focused on South African players. Named after a medium-sized antelope, the national animal of South Africa, the mobile casino in elegant green colour runs on the Realtime Gaming software which provides players from South Africa and other countries with a selection of mobile slots working smoothly on Android and iOS operated mobile devices. 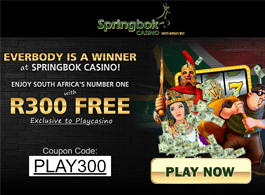 Due to its features, Springbok Casino, which is licensed in Curacao and allows wagering in ZAR, is by far the most popular casino among South African players. The mobile casino uses the platform developed by Realtime Gaming (RTG), a gaming company established in 1998 in Georgia, USA, which is respected for the stable and reliable platforms providing you with a seamless gameplay on the go. Being one of the first mobile gambling software providers, they developed platforms which stand out from the crowd by offering a high quality performance on your mobile devices. In order to access the mobile version of Springbok Casino you don not have to download an application. All you have to do is to enter the website, register your account and choose the mobile tab. You will instantly find yourself in the flash version lobby surrounded by all games the casino offers. Besides the easy access and smooth performance, Springbok Casino Mobile has gained its reputation for the fair play and secure transactions. The gaming operator uses the latest SSL encryption technology and highly secure and safe banking methods. Using the certified Random Number generators, Springbok guarantees the fairness of the gameplay and the link at the bottom of their homepage to Central Disputes Systems, an institution entitled to solve the claims by players, indicates that they are committed to taking gaming seriously. Although the online version of Springbok casino offers full range of casino games, the mobile version provides you with a selection of dozens of video slots optimised for mobile play and only few table and poker games. The library on a regular basis due to new releases which are optimised for mobile play from the moment they are launched. As soon as you enter the lobby of the mobile version of the casino, you will notice that you can choose from a variety of slot machines using all kinds of themes so you can easily choose one to your liking. The majority of mobile slots are played on five reels offering from 20 up to 50 paylines, while some of the titles are played at three reels and the latest releases offer up to 729 ways to win using 6 reels. All these slot machines cover the screen entirely letting you to enjoy crisp visuals and smooth animations on the go. All their titles are available in the practice mode, so that you can easily turn to the real money mode when you are ready to wager. All bets are expressed in ZAR and range from only R0.10 up to R5 per line, meaning that you can choose your bet whether you are a casual slot player or a high-roller. Besides regular payouts, mobile slots from RTG also deliver progressive jackpots and you will be informed about the sum you can win as soon as you enter the particular game you have chosen. Besides mobile slots, the mobile version of Springbok Casino offers two Blackjack variants, Suit 'Em Up and Blackjack 21, Double Double Bonus and Three Card Poker and European Roulette. Although these games are not hosted by live dealers, they provide you with a genuine casino experience at price affordable for all kinds of players. As long as you use an Android or iOS operated device, you can take your favourite sort of entertainment in your pocket wherever you go. The flash version of Springbok Casino can be accessed via iPhone or Android smartphones as well as iPad or Android tablets which provide you with a great gaming experience due to larger screens. Nothing is lost in the transition of games to their mobile versions and with a touch of your finger you can control all the options and enjoy your favourite titles on the move. As soon as you register at Springbok you may be awarded R11,500 welcome bonus based on your first three deposits. Upon your first payment you can claim a bonus of 100% up to R1,500 and on the next two deposits you can claim a 50% bonus up to R5,000. In order to clear the funds from your account made while wagering free money, you have to meet the playthrough requirements which can be found in the Terms and Conditions section of the casino. As for the deposit based bonus, both bonus and the deposit have to be wagered 30 times before the withdrawal. Besides this initial bonuses, you may also be awarded for your loyalty or use some of promotions offered by the casino each week or month such as free spins, freeroll tournaments or various bonuses available to all registered players who deposit at least R20. Springbok Casino Mobile offers a wide range of secure banking methods for deposits and withdrawals including credit and debit cards, bank wire transfers and virtual wallets such as EcoPayz, Skrill and Neteller. E-wallets are typically the most convenient banking option in terms of the time needed for withdrawals which usually take up to 48 hours. Besides, withdrawals via e-wallets are free of charge so you do not spend money on fees. Bank Wire Transfers usually need more time for transactions to be completed and fees can be charged. If any problem occurs, you can contact the customer support via the live chat box, toll-free phone for South African Players, international phone line or via email. The customer support is available 24/7. If you want to experience the smooth gameplay on a reliable and stable platform in the practice or real money mode you should visit Springbok Casino Mobile. The straightforward and easy to use interface with all games offered at one place and only few buttons on the screen provide you with a pleasant gaming experience on the go. South African players can enjoy hours of entertainment while wagering in ZAR in a secure and fair environment wherever they are.